Chris Kyle wants to be a cowboy. He rides bulls and drives big trucks. But the West has long since been settled, and this Texas boy finds himself aimless until he joins the Navy SEALs of 9/11. Instead of West, Kyle heads East to fight terrorists. In Iraq, he finds camaraderie among his fellow troops and a common enemy in the terrorists. Over the course of 4 tours, he realizes his purpose is protecting his friends and his country, to the point of endangering himself and putting his family second. Though it is a 2 hour plus film, most of the side characters are sketches, from the Kyle's worried wife (an excellent Sienna Miller) to the war buddy that just "needs to make though one last mission" so he can propose to his girl. Told largely from Kyle's point of view, American Sniper also offers no explanation or motivation for the people he kills. They're bad guys trying to kill his friends and that's reason enough to neutralize them. Kyle isn't a particularly introspective person, and his black and white worldview is even a coping mechanism. Question the war, he thinks, and he might start to loose it. It certainly happens to those around him. Kyle's world view, instilled by his authoritarian father, is simple: don't be a sheep or wolf. Be the sheepdog, protect the weak. Kyle expresses no guilt, misplaced or otherwise, for his kills. He did what he needed to do to protect US lives, he reasons. He only worries that he couldn't save more US lives, trying to hide his PTSD even from himself. It's this black and white, right versus wrong thinking that has created much of the "culture war" division in the debate surrounding the film. It's up to the viewer, with the benefit of not being under fire, to decipher effects and effectiveness of the War on Terror. Certainly, the real War on Terror is much more complex than battle lines on a map or Kyle's "Us vs. Them" mentality. Terror has no fixed address, and killing a radical, extremist ideology is far more difficult than deposing a dictator. Even if they disagree with the Kyle's actions, dismissive viewers have to acknowledge that the theaters of this war were decided far, far above Kyle's pay grade. Clint Eastwood bring a straightforward directorial style that suits Kyle's worldview. Unfortunately, he leaves sociological issues on the outskirts of the film which would have added some shades of grey. Kyle and his crew see themselves as cowboys, crusaders and comic book heroes (specifically The Punisher). Kyle's rival sniper, working for Al-Qaeda, was once an Olympic champion. How does one go from participating in the Olympic Games, which serve as a symbol of global unity, to remorseless killer? Though it would be bigoted to suggest all Iraqis or Muslims are "savages," a term Kyle and his crew use freely, the actions of the terrorists they target are nothing less than appalling and indeed "savage." 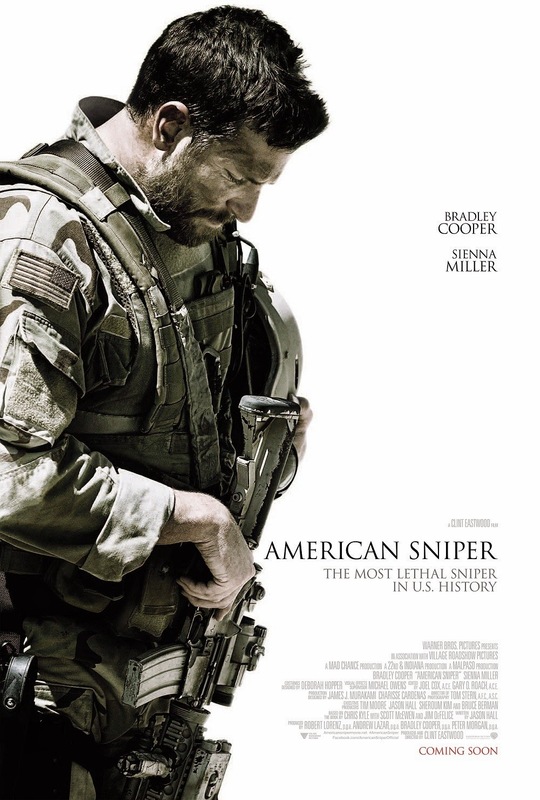 American Sniper is a fine war film that offers thrills in all the traditional war film ways. Though Eastwood constructs the film like a seasoned professional, he leaves it completely upon the audience to evaluate war in which Kyle was a participant.